In the early years of the twentieth century, the vapor absorption cycle using water-ammonia systems was popular and widely used, but after the development of the vapor compression cycle it lost much of its importance because of its low coefficient of performance (about one fifth of that of the vapor compression cycle). 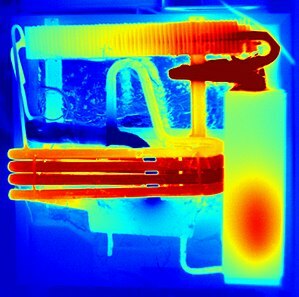 Absorption refrigerators are a popular alternative to regular compressor refrigerators where electricity is unreliable, costly, or unavailable, where noise from the compressor is problematic, or where surplus heat is available (e.g., from turbine exhausts or industrial processes, or from solar plants). Commercial production began in 1923 by the newly formed company AB Arctic, which was bought by Electrolux in 1925. 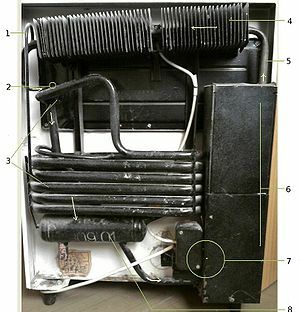 In the 1960s, absorption refrigeration saw a renaissance due to the substantial demand for refrigerators for caravans (travel trailers). AB Electrolux established a subsidiary in the United States, named Dometic Sales Corporation. The company marketed refrigerators for recreational vehicles (RVs) under the Dometic brand. In 2001, Electrolux sold most of its leisure products line to the venture-capital company EQT which created Dometic as a stand-alone company. Another variant, uses air, water, and a salt water solution. The intake of warm, moist air is passed through a sprayed solution of salt water. The spray lowers the humidity but does not significantly change the temperature. The less humid, warm air is then passed through an evaporative cooler, consisting of a spray of fresh water, which cools and re-humidifies the air. Humidity is removed from the cooled air with another spray of salt solution, providing the outlet of cool, dry air. A single-pressure absorption refrigerator takes advantage of the fact that a liquid's evaporation rate depends upon the partial pressure of the vapor above the liquid and goes down with lower partial pressure. While having the same total pressure throughout the system, the refrigerator maintains a low partial pressure of the refrigerant (therefore high evaporation rate) in the part of the system that draws heat out of the low-temperature interior of the refrigerator, but maintains the refrigerant at high partial pressure (therefore low evaporation rate) in the part of the system that expels heat to the ambient-temperature air outside the refrigerator. The cooling cycle starts with liquid ammonia at room temperature entering the evaporator. The volume of the evaporator is greater than the volume of the liquid, with the excess space occupied by a mixture of gaseous ammonia and hydrogen. The presence of hydrogen lowers the partial pressure of the ammonia gas, thus lowering the evaporation point of the liquid below the temperature of the refrigerator's interior. Ammonia evaporates, taking a small amount of heat from the liquid and lowering the liquid's temperature. It continues to evaporate, while the large enthalpy of vaporization (heat) flows from the warmer refrigerator interior to the cooler liquid ammonia and then to more ammonia gas. ^ Adam Grosser (Feb 2007). "Adam Grosser and his sustainable fridge". TED. Retrieved 2018-09-18. ^ Sapali, S. N. "Lithium Bromide Absorption Refrigeration System". Textbook Of Refrigeration And Air-Conditioning. New Delhi: PHI learning. p. 258. ISBN 978-81-203-3360-4.